Go to the Device detection tab. Click the View applications button and choose the operating system you want to view the applications for. Choose Applications from the menu in the left part of the window. The list of all applications for the chosen operating system opens (without filtering by technical characteristics or device type). 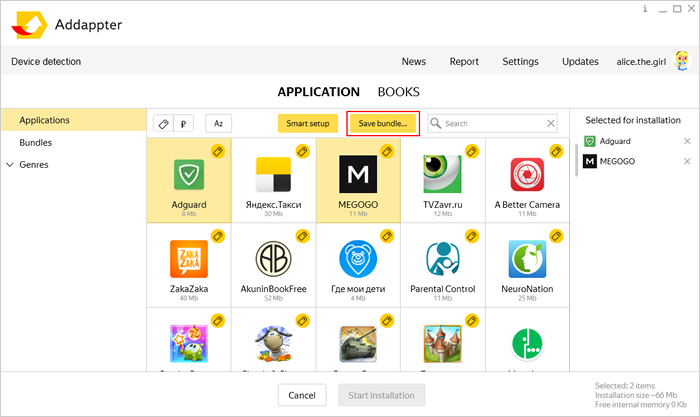 If you don't find the needed bundle in the bundle categories preinstalled in the program, contact the Addappter project manager in your store or create a bundle yourself. A bundle created by a project manager is available to all employees. A bundle that you create yourself is stored locally and can be installed only from your computer. Go to the window for viewing applications available for the operating system. Choose the applications. The number of applications in the bundle is unlimited. Click the Save bundle button and enter the bundle name. The bundle is added to the list of bundles in the Addappter program. Choose Bundles from the menu on the left side of the window. Click the icon next to the bundle you want to delete.